This $3.5 million project consists of improvements to State Road 21 south of Middleburg and north of Keystone Heights, including construction of a new bridge over the South Fork of Black Creek, as well as milling and resurfacing, base work, shoulder treatment, drainage improvements, curb and gutters and new highway signage. The project contractor is Commercial Industrial Corporation. Construction of the new bridge will take place on the east side of the existing bridge. 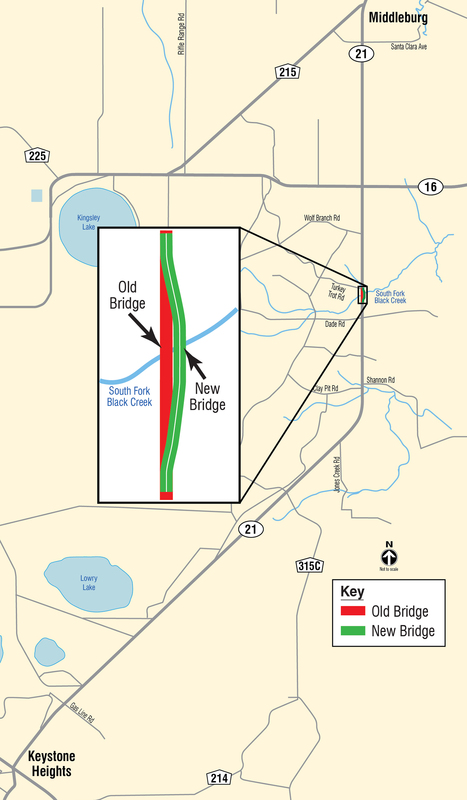 As a result, traffic can continue to move north and south along State Road 21 and over the existing bridge while the new one is built, requiring no detour. As seen on the project map, the alignment of the new bridge will result in a slight curvature of State Road 21 to the east once opened, where the new bridge is integrated with the existing lanes and traffic pattern of State Road 21 to the north and south of the project. Traffic will be maintained in accordance with FDOT design standards throughout the project. When lane closures are needed, drivers will be alerted in advance via portable, changing message signs. No lane closures will be permitted from 6:30 to 8:30 a.m. Monday through Friday. No pile driving activities or demolition of the existing bridge will be permitted from 7 p.m. to 7 a.m. Monday through Friday or from 7 p.m. Friday to 10 a.m. Saturday. No pile driving activities or demolition of the existing bridge will be permitted on Sunday. The Florida Department of Transportation urges motorists to always follow the speed limit and stay within the limits of orange cones and barrels while traveling through construction zones.